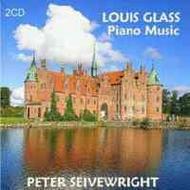 Louis Glass (1864-1936) was one of the four figures dominating the Danish musical life in the late 19th and early 20th centuries � with Otto Malling, Victor Bendix and Carl Nielsen. All four were very different, but there are some parallels between Glass and Nielsen. Glass was a composer who thought naturally and effortlessly on a large scale (his 4th symphony exemplifies this), but at the same time was capable of writing the most perfect miniatures. He wrote a substantial amount for the piano � the repertoire on this set represents less than half of his complete music for solo piano. The CD booklet contains extensive notes by Peter Seivewright. Peter Seivewright was born in Yorkshire, studied music at Oxford and as a post-graduate at the RNCM in Manchester. He has performed extensively throughout the UK, Scandinavia, Europe and the US. He has recorded the Complete Piano Music of Carl Nielsen (Naxos), the major piano works of Bendix (Rondo Copenhagen) and the Piano Sonatas of Galuppi (the last great composer of the Venetian Republic) for Divine Art.